Another one got wed this February. This time is Nurul Huda, cousin from Aunty Fauziah side. This was held on 26th February 2011, exactly two months after Nur Azizah. Although it will be a tough tough day, I enjoyed such weddings as it is a time for get together of all aunties and cousins. It was a time to meet up and have comedy moments, banter at will and ultimately to let loose. But first and foremost, there was work at hand. In between rounds of multi-tasking, I took some time to enjoy along with the karaoke singers. It was fun. Mami said, “Dia ada, meriah majlis. Gembira.” Its GEMBIRA, not GILA oh Cik Idah. I must thank Amirul for helping me with the dishes that day. I was sitting there washing and was wishing how good would it be if Amirul was around. Amirul had madrasah and he would arrived later. No sooner then I wished, someone hugged me and said “Abah!”. HE HAS ARRIVED! THANK YOU GOD! Immediately, I took off his punjabi top and got him to sit down and do the dishes. He had a lot practise over the years so I left him to it while I made my rounds to the front. Also took time to stare at my sister’s singing to which the DJ laughed. Plenty of people help. Everyone was automatic. Fantastic. Fun to have wedding at void deck. Kecoh and meriah. The DJ was good on that day. Not live band but to me, it was better than the one we had at Azizah’s wedding. Accommodating, everyone and anyone can join in karaoke – except my sister should be barred. Actually props for taking the mic. Kak Faridah, ooooooiiiiiiiii…sungguh happening. Menjadi-jadi dia. Anyone got video of this? i want to upload. Hary also sang. Very good brader. Boleh nyanyi. Actually, who can go wrong with “Kau ilhamku”? There were plenty of videos and pictures. I will endeavour to get them and update this post. Tapi ni best ah. At the end of it all, we really let loose. Especially this old man. Buang tabiat agaknya. My mum decided to surprise Amira with a birthday song since her birthday falls on the 28th February. Mum gathered everyone near our resident table and informed the DJ. Soon the DJ made the announcement and everyone sprang to sing. It caught her off guard and she cried covering her face. She is not up for these things. Just not interested to be in the center of attraction. I kinda miss the first shot when they sang along with the DJ music. Too busy washing dishes ah kan! So I got them to sing it another time. Our event was held on a Saturday. The groom’s wedding reception was held the following day on a Sunday. So we arrived at about 12pm and waited for the groom to arrive. Sibuk lah semua menyiap diri. 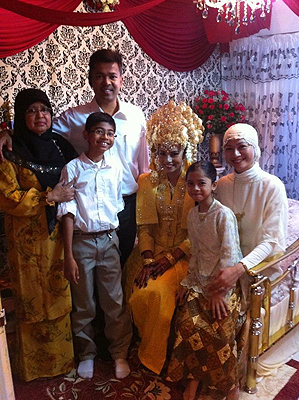 We manage to take photo with the bride as a family as I didnt manage to take the day before. At about 1330hrs, we arrived at the groom side. I took a video of the whole proceeding, so its self-explanatory. Good tutorial for those thinking of getting married. So now two down. In the works two more; Azimah’s which is a year from now and her sister Sarah, the year after. Just have to make sure my knees hold up.